This morning (after spending an hour working on my taxes) I was pleased and surprised and so so flattered to see one of these cups on SouleMama. Because of the response, I've listed ten of these cups on etsy, with a 3-4 week delivery time. These pictured have homes already. After I straightened away today's tax prep, I hustled upstairs and threw 12 tumblers. Tomorrow I'll paint and etch them. It is a beautiful blue-skied day here today in Memphis, feeling cool and almost wintry again (to clarify, winter here is low 50s most days, cool enough to need some heat, but not cold enough to freeze anything). I'm happy with my morning's work and am ready to get my boy from school, do a little more pottery-painting and drawing, and am thinking about roasting some cod with my frozen stash of cherry tomatoes and olives and purple onions for supper. Have a lovely week, friends, and thanks as always for your support. I have finally restocked my etsy shop. There are latte cups, a few honey pots, new mugs, and more solid-colored spoon rests. And more to come- both locally and online. Saturday's last market day was good- events unfolded so that it was bitter-sweet, more sweet than anything else. My instincts that it was time to go were validated- friends were sad but happy to see me embarking on a new chapter. Now- to begin that new chapter? What shall I do? I'm listening to myself, to my customers, to new opportunities that come knocking. I'm revising my plans and my expectations of myself. One large revision is throwing away expectations of perfection. I'm embracing wabi-sabi- all of my work shows my hand. There is a flaw in every piece because I am a human, flawed, wonderfully imperfect. And I'm getting to the point where I'm ok with that. I'm not going to kill myself trying to make work that looks like it rolled off a factory line somewhere and should be sitting at (name your favorite large kitchen-ware retailer)__________. Stopping that right here. Happily. I have shelves full of work to be fired upstairs and am waiting until it is just a *little* cooler before I fire again. We've had 2 weeks of 100+ heat indices and actual temps of 95+. I think most of the country has. I'm in no hurry. It's summer. It's the south. We move slowly for a reason (but we're thinking fast, don't let our pace or drawl fool you!). Ok. all done. Y'all have a nice weekend. I've been holding a bit of news close to my chest for a while, not completely certain that it was going to happen, but it did! look! I'm just as tickled as I can be! I'm in Southern Living!!! The cups are, of course, over in the shop. I'm ready to make more this week as I can fit in the time. When I got an email from the editor for the "Made by Southern Hands" column at the end of October I screamed my fool head off. Many of my friends have known about this for a while, but I didn't want to spill the beans too early. We got a call from a relative on Christmas Eve telling us that her copy had come in the mail- I picked up my copy at the grocery this morning. I hope you had a lovely holiday- we did- and this just caps it off! I know now that I absolutely made the right decision to cut back on my expectations of what I could accomplish, pottery-wise, this holiday season. In the past week my house has been struck by the flu (little boy was down for 5 days, which meant that I was pretty busy during that time) and a pot that had cracked due to thermal shock (read, I opened the kiln when I shouldn't have) spontaneously exploded two weeks later, cutting my hand pretty badly. We spent Wednesday afternoon at the doctor's office getting the cut glued back together (I love advances in medicine sometimes) and I realized that I needed to scale back even further. So this week we spent a great deal of time cozied up on the sofa, reading, drinking warm tea and cider, decorating the tree, resting, getting well. I do have one tiny little holiday offering in my shop. I've been making these little nest ornaments this fall- I had a few dozen for sale at events in town, and there are ten over at etsy. The nest is thrown and altered; the eggs are hand-formed. I kept back quite a few to use as package toppers. They make me happy. It has gotten so cold here - today's high is 30, the low is 16. For the next few days Memphis will be colder than New England. I don't remember December ever being so cold here- I'm wishing for a wood stove and cranking out wool sweaters and fuzzy mittens to keep my family warm. I hope you have a good week- be well. The etsy show last weekend was a three-ring circus. Very well attended, good publicity- there seemed to be some buzz. I just put these four bowls up in my shop. I haven't been making as many this summer as in years past. I do plan to have more in November, right before Thanksgiving, for holiday giving. I finally got my little kiln plugged in and fired it on Monday. I'm reserving it for small batches and my drawn-on pieces. 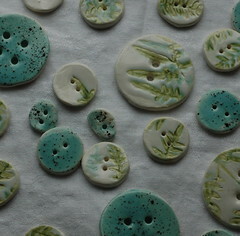 The big kiln is running right now with some re-glazes for the weekend. I've been asked to make some sacramental/liturgical items that might appeal to men and boys. That's something big to think on, design-wise. Color-wise, I know just where to go. But it is the motif that has me slightly stuck. some tumblers and honeypots for Friday night. What doesn't sell will go on etsy. If there aren't any left (wouldn't that be nice!) I'll be making more. Is it fall-like where you are? Mid 90s here again today. Next week will be cooler. I'm ready for crisp. And not the dry, parched crisp we've had all summer, either. This summer my good friend Papatya and I started talking about promoting etsy artists and artisans in Memphis. We've been talking about it all summer, and now it's here. The wonderful Lisa at the Center City Commission found a great space for us and 12 other etsy artists. I am so grateful for her help! This is a one-night-only show full of all kinds of vintage and handmade goodies. Early holiday shopping, anyone? If you're in town and out and about, I hope to see you there! I'm so glad that it is here. This has not been the easiest week on record- not a good week to be a Bridgman chicken. We're down to two hens. And they're flipping out just a bit. Funny thing was another friend had one of her araucana "pullets" turn into a roo, as well. I'm slowly restocking my etsy shop- these teacups are there, and there are a few berry bowls up, too. I've gotten some really nice bloggy props this week. I really appreciate it, friends. I hope your weekend is restful. See you on the other side. It is *almost* officially spring. Next week it comes and I couldn't be happier. We set our clocks forward this weekend- I am looking forward to longer days and sunshine. The daffodils are beginning to pop up in Memphis. The early plum and cherry trees are blooming; the forsythia is putting on its glorious golden cloak. To celebrate the beginning of bringing-flowers-in-again season I'm putting up a handful of my egg vases- big and little, creamy and blue, all speckled. Making them makes me happy- I don't even mind glazing them, and glazing is my least favorite part of the pottery-making process. Using them, and seeing them in use, makes me even happier. Have a lovely weekend, everyone! Every year for lent I try to take on the habit of gratitude. It is starting early for me this year. The response from you- my readers, my friends, my loyal customers- to my little fundraising project for Doctors without Borders efforts in Haiti have blown my mind. I am truly, truly humbled. So far, you've brought in almost $250 (ETA-I'm about to go to bed early, and at 8:20 CST, we're almost at $300! YAY!) . There are some other crafty benefits going on- so SO many artists have donated to Craft Hope's efforts. I added an egg vase, but it's gone. There is one left in my shop and a few more in storage I can dig out if need be. My friend, Tomi, a metalsmith and jewelry extraordinare, has organized an auction of handmade rings to benefit Haitian relief efforts. Find out more about the rings and auctions here. I'm grateful for your outpouring of support. I'm grateful for my home and family. I'm grateful that we're all feeling for others, and forgetting about our own hardships for the moment. Thank you, and have a wonderful weekend. you know, I am going to have an etsy update. And I'm going to donate 60% of all sales (I'm keeping the rest for my IRS obligations) to Doctors without Borders to help out with Haitian Earthquake relief efforts. My church, led by one of our deacons who has been blessed with the gift of hospitality and works tirelessly to feed the hungry, works with the Haiti Partnership, an ecumenical group here in Memphis, to send a group of doctors, pharmacists, and other good-hearted people to Haiti twice a year to work with St. Vincent's Hospital and Orphanage in Port-au-Prince, and St. Paul’s Church (Episcopal)in Montrouis, Haiti. And one of our neighbors was a volunteer with the Peace Corps and married Erenante, a lovely woman from Haiti. Their children and my son are classmates and good friends. We were overjoyed to hear that her immediate family was safe, concerned for her other family in Port-au-Prince. My heart has been heavy for Haiti and her people. So. I will have mugs, sets of tiny bowls, a cake plate or two, buttons, and egg cups up at my etsy shop. And I'll have them up by Friday. 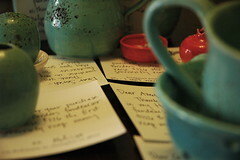 If you want some pottery and you want to alleviate any post-holiday shopping guilt, know it will go for a good cause. I'll update again on Friday with photos of some of the "new" work I've listed and I'll update again with a total of what I'm turning over to Doctors without Borders. I can't do everything, but I can do something. Finally, I feel like I'm at a point where I can relax. Shows are over. Pottery is packed up for either a mid-winter (valentines?) etsy restock or I'll just hang on to it for spring. I did promise more berry bowls, so there are six little bowls in my esty shop. I won't promise delivery in time for Christmas for any sales made after Saturday. I'm shipping some custom orders tomorrow, putting the sale pottery bins on their proper shelves in the basement, and then, friends, I'm focusing on knitting. Aren't these just perfect? The pattern is here. These are for little boy. I may have to felt them again, but I don't want them so small that he'll grow out of them before next winter. They're the same size as his shoes, but. . . .
To reward myself for all of my pottery work, I bought a little happy. What I really want are some cloggy boots like these, but unfortunately, none are in my size (37 if you're asking, and of course I want red!!! Or blue. Or chartreuse**.). Or my price range right now. So I treated myself to this instead. I've lusted after Vesper Sock for quite a while, and this hank will go in my stocking. From me. Last day of school is Thursday. I have packages to mail (tomorrow), gifts to wrap, cards to send (or not), cookies to bake. Dozens of rosemary or lemon-thyme shortbreads. Maybe both. All I know is that I feel relieved that the sales season is over. It was good, productive, exhausting. And I know deep down inside I'll want to start throwing again the week after New Year's. So. Merry Christmas. Happy last days of Hanukkah. Happy Eid. Happy Solstice next week. Happy Kwanza. I'm going to enjoy the holidays with my family now. Lord I feel so relieved for the break. *I came back to amend this and saw my crazy post title. "wrapping up!s"??? O.K. ** I have chartreuse cloggy boots headed to my house. Merry Christmas from my wonderful mom who knows what REALLY makes my day. YAY!!! I had a beautiful day yesterday. Did you? I hope so. At 10 am these will all go up over at my etsy shop. I also have a little shelf full of other work that I need to photograph and list. Some today, some during the next week. After a little "work" time, we're going off to hike in the woods. I hope you enjoy your day, too! I have finally, finally added new work to my etsy store. Not NEW new, but new to the internets new. I'm still cranking out berry bowls, and on monday night, after we only have a high of 92, I'm going to bisque fire them. Hopefully I'll be able to glaze fire the following week. I promised my family that they won't have to suffer two air-conditioner-less nights in the same week. So. This update has a lot of bowls. Egg-glazed bowls, color bowls, a few cafe au lait bowls. Those are my most favorite. And some ladybug cups, too. I'll be back here tomorrow or sunday to tell you about my local meal and my local-sourcing coup. Have a great weekend, everyone! 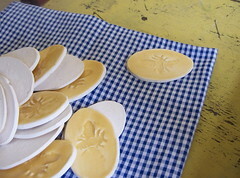 Yesterday I brought in this pile of bee medallions to make into promo pieces for my etsy packages. I sat down to check email for a second before running up to the studio and was struck with the color and composition of the yellow and white forms on the blue gingham napkin*. The bee is made with my normal logo stamp- I was really happy with how they turned out and am considering making some mugs with this bee-oval on them. I've made vases and pitchers with a bee inside a circle, thinking of old french and italian wine carafes, but the oval really speaks to me. These magnets are made with rare earth magnets. One 1/4" round magnet is strong enough to hold up a calendar. I don't think I'll be selling these (maybe at the farmers market in Memphis, but not on etsy), but they will be in every etsy package I send until I run out of the magnets. I always love getting a little unexpected happy, don't you? *When Gary and I married, we had a huge shrimp boil and bbq -ribs and pulled pork, Memphis style- at a place called "the Gin," really a college-mixer type bar- that had a huge, shady patio, just off the square in Oxford, Miss. My dear mother in law bought yards and yards of cotton gingham to use as napkins for the event. The lady really knows how to throw a party- she is quite the hostess and sets a beautiful table. After the event, she washed all of the used napkins and gave them to me. I still have a pile of rolled napkins, tied with raffia from the dinner, in my china cabinet. We have about 20 of these in rotation for daily use. Every time I use them, I think about our rehearsal dinner. I love using them, and they are the hardest-wearing napkins ever!